In the post-industrial United States cities all across America have been left with an abundance of rail right-of-way that once served industrial properties. Cities have since struggled to find a use for these rail corridors. In many cases the rail right-of-way either gets built over, or makes room for some other use – most typically a park or trail of some sort. The most famous, and perhaps most unique, example of this is New York City’s Highline which converted an abandoned freight rail corridor into an elevated park. In most cities, however, much simpler trails are developed in order to cater to bicyclists and pedestrians. These are great projects, but in the cases where rail right-of-way is needed in order to introduce rail transit, they should not be done. The acquisition of right-of-way can be one of the most difficult hurdles to clear when developing rail transit, so if you have a prime corridor intact, you should do everything in your power to preserve it for future rail transit. Map of the proposed Wasson Way Project. The reason this is particularly important in Cincinnati right now is because on March 6, advocates of what is being called Wasson Way Project will present their ideas for converting the Wasson Corridor into a bike/ped trail to City Council’s Strategic Growth Committee. The idea is not a bad one on face value, but should it proceed it would eliminate one of the most valuable rail corridors in the city. A corridor that could connect neighborhoods like Hyde Park, Oakley, Evanston, Norwood, Mt. 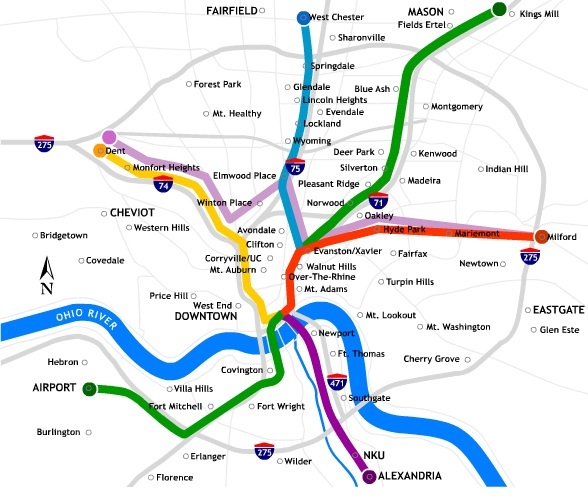 Lookout, Fairfax and Mariemont with light rail and eventually connect those neighborhoods to the region’s two largest employment centers – uptown and downtown – without much additional track or right-of-way acquisition. Rail corridors that run through areas of limited potential transit ridership like the Oasis Line should be redeveloped into trails. It just makes sense. There is less automobile traffic and the riverfront trail provides a scenic ride for bicyclists and connects its users to a string of riverfront parks. The Wasson Line, however, is ripe for light rail service with its densely populated neighborhood, vibrant business districts and key attractions along the line. The Oasis Line should become a bike/ped trail, but the Wasson Line should not. Unfortunately the exact opposite is progressing for both of these lines in Cincinnati. 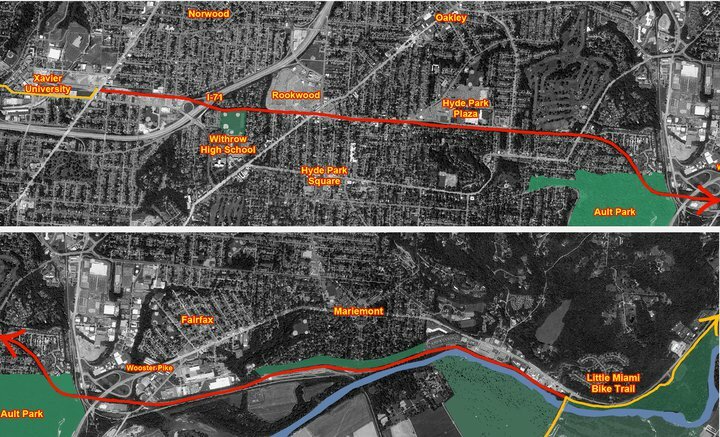 Hamilton County officials continue to explore funding options to turn the Oasis Line into a commuter rail corridor, and a citizen-led group is strongly advocating for the conversion of the Wasson Line into a bike/ped trail. While UrbanCincy supports conversion of some rail right-of-ways into other uses, we believe it needs to be done in a thoughtful manner that considers the future transit needs of the region. The Wasson Line is too valuable to convert into a bike/ped trail and should be preserved for an urban light rail line. The upcoming committee meeting is scheduled to take place at 12pm on Tuesday, March 6 at City Hall (map). We would like to urge you to come out and support the future of regional light rail in the Cincinnati region, and request that the Wasson Corridor not be converted into a recreational trail.